OPSO is an attractive little device. Measuring 3.25 x 2.5 x 1.13 inches (82.6 x 63.5 x 28.7 mm) and weighing in at 2.7 ounces (76.5 gm), OPSO can fit in a pocket or bag without taking up too much room or weighing you down. The design of the charger is perfect: it acts as a surrogate wrist you wrap your Watch band around and there’s a standard Apple Watch charging “puck” on top. It’s wrapped either in fabric or leather accents to make it look attractive, and there are just two interfaces: a Lightning port for charging OPSO and a button/LED for determining charge status and turning the charger on and off. The fabric version is priced at US$39 and the leather version at US$43. Considering that the Apple Watch Magnetic Charging Cable costs $29, OPSO is a bargain for portable charging that doesn’t require a nearby power outlet. OPSO is designed to charge your Apple Watch enough to top it off for up to four days of continuous use. After that, you’ll need a “charger for the charger” to give the 2100 mAh OPSO battery a boost. For a weekend camping trip, OPSO is a great solution. What I like the most about the design is that I don’t need to take an Apple Watch charging cable with me on a short trip — when my Watch needs a charge, I just press the button on the side of OPSO, take off the Watch and place it on the charger, and give it a boost. 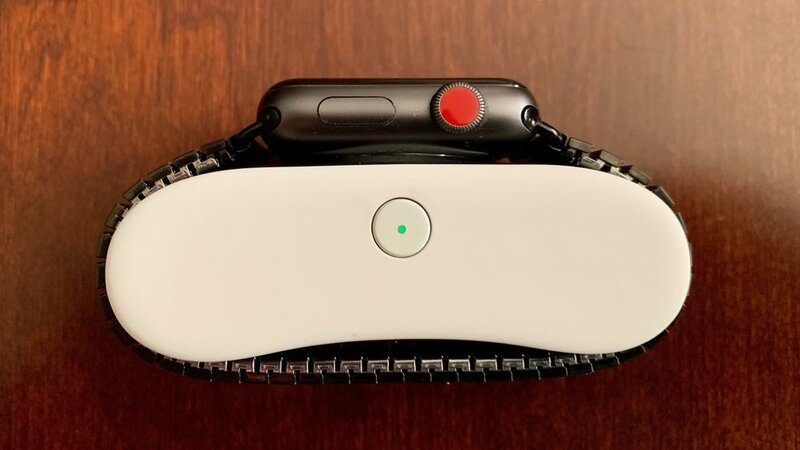 I found a perfect use case for OPSO this week, when the two Apple Watches in the household (mine and my wife’s) began insisting that we update to the latest watchOS version. Usually that meant either dragging a Watch charger to where we are sitting, or leaving the Watch on a charger somewhere away from our location. With OPSO, I pulled my iPhone out of my pocket to bring up the updater in the Watch app, placed the Watch onto OPSO, and everything was done with a minimum of fuss. When it was done, I carried OPSO over to my wife so she could charge and update her Watch while she was doing some other work. OPSO is really one of those great ideas that you look at and say “Why didn’t anyone — especially Apple — think of this before. Combining a portable design that can go anywhere, enough power for multiple charges, and an intuitive user interface, this is a crowdfunding campaign that every Apple Watch owner should support.